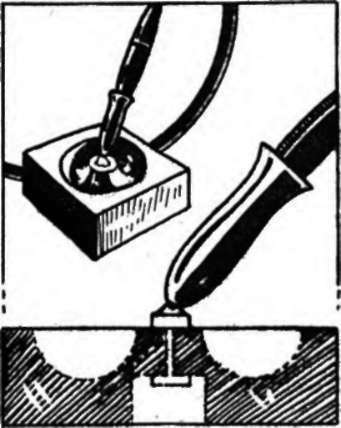 The construction of this set, as shown by the drawing, Figure 62, consists only of cut ting-off, polishing and drilling, on the face which is all done at one setting in the lathe, after which the block is turned over and counterbored from the back to take the nut on the pen-works, then the sides are polished. The well around the pen-base is used for clips, etc. A good color is Brazilian onyx, because it so closely simulates the genuine stone, but there are many other more striking mottled colors. 1/2 of a #CP1 cyl. 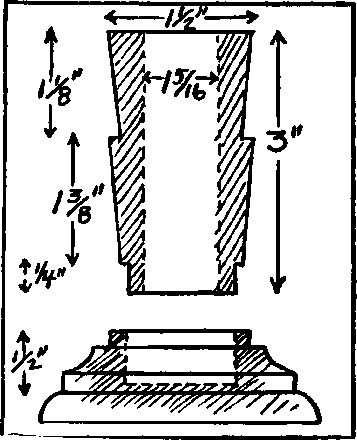 This is a straight turning and cementing job, the cylinder being turned down to the dimensions shown Figure 63, either between centers or on a mandrel. Both upper pieces can be turned and polished at the one time, before cutting off. The bases are turned from blocks cut from 1" sheet of a contrasting color, or can be built up by cementing pieces of 1/4" sheet together and then turning. The material is cemented to the faceplate, and the turning, boring for the shank and the polishing all done at the one setting. Materials: 3/16" sheet and small tube. Figure 64 illustrates a jewel-like contraption that will delight any woman—practically a complete vanity outfit and make-up kit in itself. The lower body consists of a turned hollow wooden block (or plastics) capped with a sheet of plastics, a series of holes being drilled through cap and all, down to the bottom sheet, to take bottles of perfume, rouge and other containers of preparations. In the hollow center is mounted a mirror on a rod extending through the whole, having a knurled end which permits the mirror to be tilted to the desired angle. At the back is a small frosted candelabra light-bulb mounted above a small piece of plastic cylinder. An interesting added touch would be to mount in back of this light a longitudinal third of a #6 cylinder in a light color, jig-sawed with a pierced design and an irregular outline coming to a point at the top, sort of in the nature of the carved screens frequently placed behind Oriental idols. Fig. 63. The candle-stick in Project 60, a design subject to infinite variation. Can be made of the same or contrasting color, or with a red ring- inserted between the two pieces shown above.